This walkway is signposted at both ends as Kapiti Walkway Stage 3. It goes between Raumati Road (entrance midway between Rata Road and Matai Road) to Poplar Av/Matai Road corner. The length is 2.4 km and a one-way trip is around 45 - 50 minutes. Starting from the Raumati Road end the track goes through some horse paddocks and over some small hills. Look for the styles to cross the fences. You can enter/exit the walkway from Gavin Road and Menin Road entrances. The middle of the walk has some narrow and slightly overgrown paths; watch out for the large area of nettle. There may also be some large puddles after rain. A side-track parallel to SH1 goes alongside a drain and beside the back gardens of private residences - it does not exit to Raumati Road so return the same way. Horses may be on the track at times. Whilst there are many side-tracks, the main route is well formed and fairly obvious along the length although it is not marked with posts or other signage. 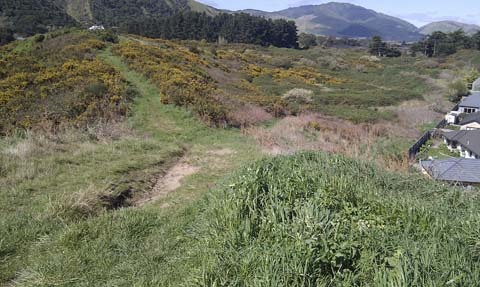 For a loop walk, you can return via Matai Road, or for a longer round trip consider combining it with Mataihuka Walkway. Turn off SH1 onto Poplar Av or Raumati Road. The entrance to the walkway is about 1 km from SH1 in each case. The proposed western link road is planned to go through this area, so enjoy it while you can!